You probably think that as a semi-professional thrifter I’m able to resist spending oodles of money on vintage at Mighty Swell sales. That is actually 100 percent untrue. 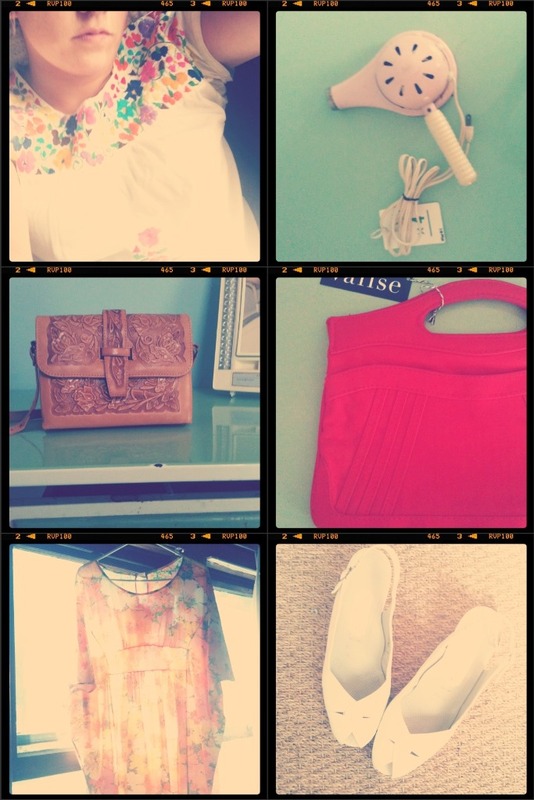 Pictured above are some of my favorite finds from the weekend…and here’s a little about each. 1. I ogled this cheery embroidered top from Pink Vintage the entire first day of the sale because it was on the mannequin by the check out. When we changed her outfit out the next day, I realized how cherry the blouse was and put it in my to-buy pile immediately. I love the bright flowers and the cropped cut. I paired it today with my favorite Dickie’s cut-offs and flips…so summery. 2. It was love at first sight for me and this this powdery pink hair dryer from Teacup Vintage. It still works! 3. I’ve been using my mom’s vintage tooled leather handbag so much lately and it’s starting to show some wear. When I saw this incredible purse from Bourbon & Lace, I knew it would make a good stand-in for my mom’s hand-me-down. The rose pattern is so lovely and the inside is mint. 4. Rae believes that every woman needs a killer pair of red heels. I concur, and would also add that a bright red handbag is another must. This looks-new canvas clutch from Valise Vintage was a deal at just $10. 5. This faded caftan from Pink Vintage is to die for. You can’t tell from this shot, but it has these cute little ties that cinch in the back, making my little “ladies” look hot and keeps it from being too maternity-ish. I’m plan on wearing this around my house in heels, my hair in rollers, a martini in my hand. 6. My favorite white high heels have been worn down to pathetic little nubs and I’ve been unable to find suitable replacements despite my frequent thrift trips. So, when I tried on these cuties from Ramble & Pluck, I knew I had to get them. They are really comfy, like my worn-out pair, and they fit like a glove. A total steal at $14. I also went home with a creamy yellow ’70s skirt from Patterns. I have a couple others similar to it in other colors and find myself wearing them frequently to work with a simple tank. From Top Drawer Vintage, I got pink and red beaded necklace for $2. It needs to be restrung, but it’s really cool. If you found some special somethings at the sale, be sure to post a pic on our Facebook page! We adore seeing Mighty Swell purchases being worn, loved and styled by you. I’m off to the couch to catch up on some old “Roseanne.” The fashion in season one is so rad! This entry was posted in Uncategorized and tagged good times, mighty swell, shopping, vintage by highplainsthrifter. Bookmark the permalink. I have already received three compliments on my new purse! And I love Roseanne as well! Hope to see you soon lady!